Bottom: Sue Godfrey in the nature park named after her with the old South East London school behind. Well, obviously I don't, none of us go back that far. But it must once have been true. Even more recent times get forgotten too. Many residents on Crossfields - those who have lived here for many years or who have family who lived here before that - will have already forgotten much of what it was like to live in the area back in the day. Anna has asked us whether any of our blog readers would like to participate in the project. And she is happy to collaborate with the blog so that residents' tales don't disappear onto a library shelf in academia but remain accessible to present and future Crossfielders. Do you live in New Cross, Telegraph Hill or Deptford? 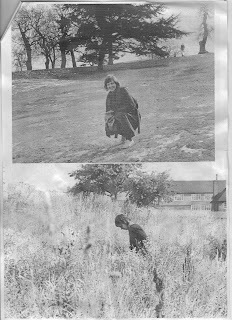 I am a BA Anthropology student at Goldsmiths College, writing a dissertation on memory and geography in New Cross, Telegraph Hill and Deptford. I am looking for local residents who would like to get involved in my project, taking part in informal, short conversations about their memories and recollections of everyday life in these areas. Of course, Crosswhatfields would be equally pleased to receive emails which we will pass on to Anna. Or if you prefer, you can simply tell us your tales in the comments box below. As we reported in October, Betfred have reapplied to Lewisham Planning for the site at 93 Deptford High Street after having their appeal to the Government Inspectorate turned down. This has meant a campaign-weary community having to repeat their previous objections. Presently there are 23 objections filed on the planning portal for application DC/11/78506/X. Last time there were 84. Hopefully the smaller number of objections will still be enough to support Lewisham should they be minded to turn the application down again, but if you can spare some time in the next week and don't want to see an eighth betting shop opening on our high street, please write in to object. The target date for receiving objections is 6th December. Jon wrote to tell us about the comedy club he runs with comedienne Holly Walsh at the Amersham Arms in New Cross. Here's the line-up for the last two nights of this year...One of the evenings features a Crossfields resident (but you'll have to go along to find out who)! 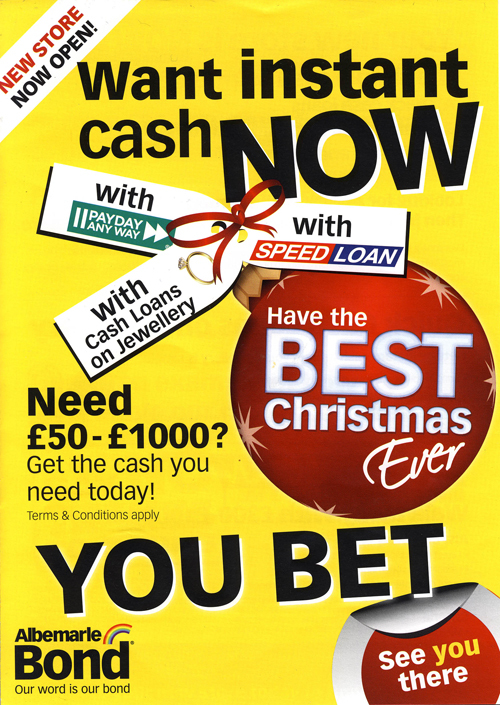 Pawnbroker update: Want instant cash now? YOU BET! 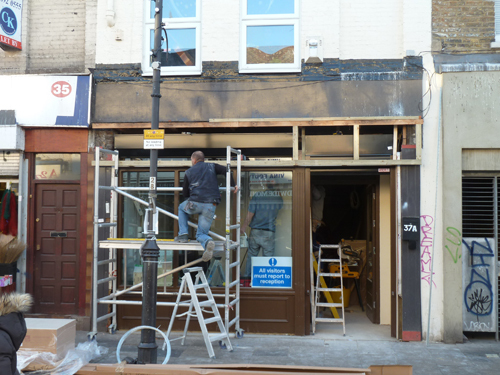 Last month, our appeal-wary planning department were obliged to give permission for Change of Use to the fourth pawnbroker on Deptford High Street. Abermarle & Bond's new premises is opposite Ladbrokes, William Hill, and another pawnbroker, The Money Shop. It is quite near Paddy Power and Better, and not far from three other pawnbrokers – in fact there will now be four pawnbrokers within 50 metres of each other. However, as the Dame recently pointed out, Lewisham Planning did not grant permission for them to change the shopfront, and asked them to apply separately for this. But barely a day had passed after Change of Use was granted (from Sui Generis to A1 Retail) before Abermarle & Bond had set about refurbishing the shop. The shop is almost ready to open (the picture above was taken last week). The target date for their application to be decided is 27th December 2011, but a new shop front is already in place – in time to cash in on the Christmas trade. The applicant's flagrant disregard for local planning rules is also demonstrated by the distribution of leaflets in the local neighbourhood which confirm the fact that they are first and foremost a Financial Service and NOT a retail outlet: "Say NO THANKS to banks" "Quick cash loans" "No hassle and no credit checks" APR: 581.9%. Pawnbrokers are classed as A1 Retail as long as the other services they offer (cheque cashing and pay day loans) remain ancillary to the main use as pawnbrokers/jewellers. But selling jewellery is now a small part of the service since people are selling and pawning their gold rather than buying it. The Telegraph reported four days ago that Abermarle & Bond said the value of gold it had bought off customers had increased by 83%, adding that the market for retailing gold jewellery remained very weak. It continued to prefer to scrap second hand jewellery if this generated a better return on capital. Cash loans on jewellery are often third on an advertised list of services, after Pay Day Loans and Speed Loans. Pawnbrokers are no longer simply a place to get a quick cash loan on some jewellery or prized possession, but have instead become extremely aggressive loan sharks. 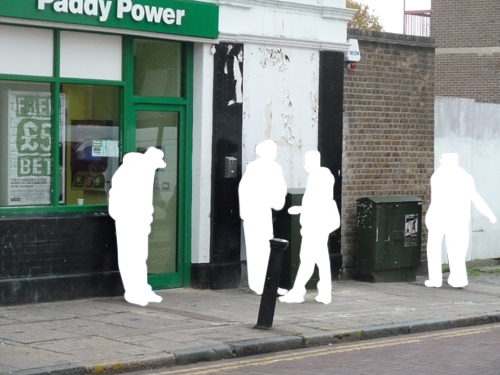 They are part of the cycle of poverty, and not, as they claim, any part of the solution – since a high interest loan can easily spiral out of control, especially when the lender is situated in the immediate vicinity of bookmakers. Abermarle & Bond's advertising "Want instant cash now? YOU BET" is a not very subtle nudge. Pawnbrokers are also extremely poorly regulated and monitored, hence their nickname "robber's shops" (no pun intended) – who knows where the gold they are buying has come from? And they inevitably set up shop in poor areas where there is a desperate need for cash and people have no credit ratings. Abermarle & Bond's financing is by Speedloan Finance, a sub-prime small loans company specialising in making loans to people who have difficulty maintaining repayment schedules. We need better alternatives to banks and better solutions to debt management than this new breed of pawnbroker can provide. 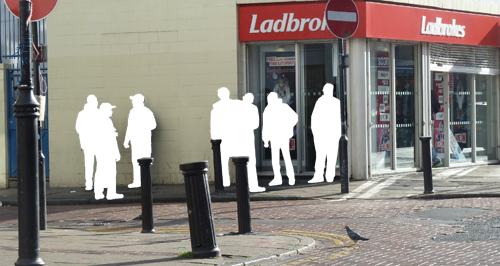 Like the betting industry, the corporate pawnbrokers are set on a massive expansion in – or, rather invasion of – Britain's poorer high streets, aiming to make huge profits from the recession. Their present DUBIOUS planning class as A1 Retail (because they sell jewellery) allows them to pop up wherever they like – usually next to bookmakers (for obvious reasons). Local authorities across the country are unable to turn them down in the shopping areas they have designated to be RETAIL ONLY (that is, not Financial Services). Joan Ruddock MP is leading the fight to stop the corporate Betting Shops by attempting to introduce a Bill to give them a Planning Class of their own. The same should be done to curb the invasion of sub-prime loan sharks masquerading as jewellers. Write to your MP now! See previous post on Abermarle & Bond here. 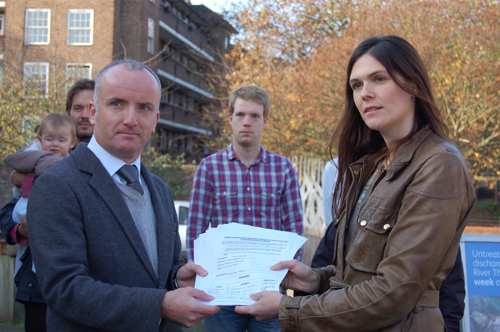 On Saturday morning (November 19th), Liberty Mosse from Don't Dump On Deptford's Heart campaign presented a petition totally nearly 850 signatures to Nick Tennant, Communications Manager for Thames Tunnel. This was the third and final day of their consultation drop-in at Creekside Discovery Centre, which, according to Thames Tunnel, had over 130 visitors. The petition objects to the proposed use of land in Deptford Church Street as a construction site to intercept the Deptford Storm Relief tunnel. "I was looking for figures about the impact of noise and vibration on Farrer House, which was mentioned, with Congers House, on page 103 of this large "reference only" document. It stated that Farrer House had five storeys. It actually has four. In tables on subsequent pages containing the figures I wanted, Farrer House is not even mentioned although Congers House is. It seems therefore that despite being just as close to the proposed site as Congers House and the (storm relief) tunnel itself passing under its back lawn, the effects of noise and vibration on Farrer House have not even been considered or recorded in this document. I pointed all this out to the Thames Water people there and they promised to do something about it. I told them that as this document firstly attributed a non-existent extra floor to Farrer House and subsequently ignored its existence altogether I had some justified doubts about its general accuracy." Jim would also like to see any Cost Benefit analyses of the Borthwick Wharf and Deptford Church Street sites so that he might evaluate their data and conclusions, but has yet to be furnished with the details. Those who missed the consultation can find out more by downloading the relevant documents from the Thames Tunnel website – not only about the site on Deptford Church Street, but also the site at Greenwich Pumping Station, just the other side of the Ha'Penny Hatch (work on which will last over five years). At times during the latter's construction, work would be continuous, and most of the materials to and from the site will move via Norman Road. But it appears the footpath, whilst being diverted, will remain available to use. 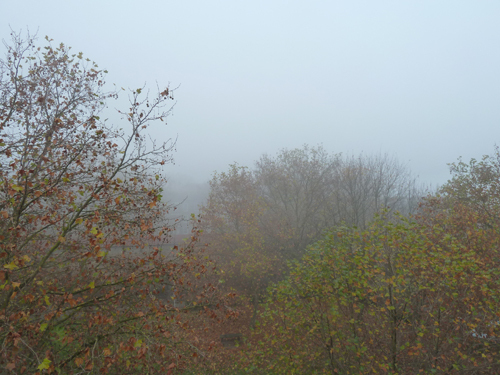 The fog that hung over Deptford and Greenwich yesterday resulted in the welcome disappearance of the looming tower blocks that now surround us. 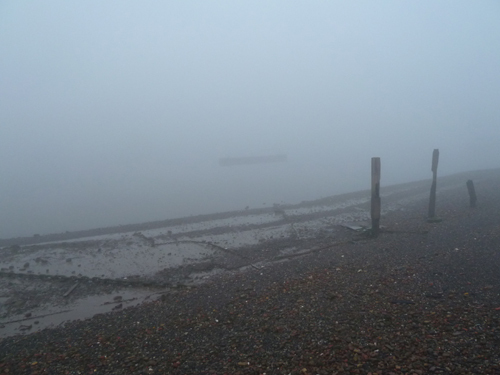 ...and down by the river at Greenwich, north London has vanished. 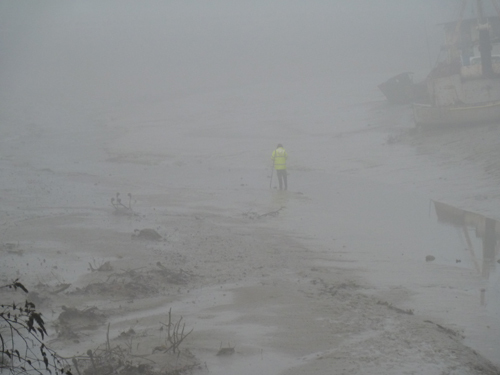 Thames Tunnel worksite on our doorstep – say no! Further to our previous post, we urge everyone who lives on Crossfields or Deptford to visit the Thames Tunnel consultation exhibition at Creekside Discovery Centre, which runs until 4pm on Saturday (see details at the bottom of this post). Although we've been carrying news of Thames Tunnel's proposals for some time now and the local opposition against them, readers should know that up until recently, the site opposite Farrer and Congers House had been presented by Thames Water as an alternative to a preferred site at Borthwick Wharf down on the riverfront (click on the image below to enlarge). Now that Phase Two of the consultations have begun, the Deptford Church Street site has become the preferred site. For us, then, this is really Phase One – and the only phase – of any consultation about this site. It's time to speak up! Thames Water are now saying they prefer Deptford Church Street because there will be less disruption to residential areas. Much work will involve material (or spoil) that is dug up in the construction of an 'access chamber' being transported away from the site in lorries, and the access from Borthwick Wharf to the main road is via Glashier Street through the Millenium Quay development. Not particularly nice for those residents. However, Thames Water boast in their literature that, in general, much (between 50-75%) of the spoil being taken away from such work sites (or new material such as concrete being brought in) will be carried by river. What better site could there be than one on the waterfront? Meanwhile, at the Deptford Church Street site, all spoil dug out and materials arriving will go and come by road, with no river to lighten the load. Church Street will be reduced to two lanes during a large part of the construction (over three years). There will be noise and dust continually. And here, there are not only a large number of residential homes surrounding the site (as there are at Borthwick Wharf), but also a primary school, several businesses and a listed church. This contradicts Thames Water's own Site Selection Methodology, as pointed out by Crossfields resident Jim Kirk, who says, "Its evaluation criteria specifies that areas close to schools, residential areas and historic buildings are reasons not to pick a site." Thames Water have argued that we're already used to noise and dust from a busy road and railway. Right, so we want more? Joan Ruddock chaired a packed hall at a public meeting on Tuesday evening at the Sally Army Hall. Although as Chair she remained impartial, as MP for Deptford she believes the proposals are not acceptable. Although some Lewisham councillors were present, notably Cllr Alan Smith, no local councillors attended the meeting where presentations were made by Thames Water and the Deptford's Heart campaign before a heated debate took place which went on until 9.30pm. See the report at East London Lines. 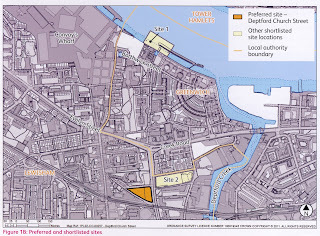 The previously chosen site at Borthwick Wharf is actually within the borough boundary of Greenwich, bang next door to the riverside development Millennium Quays on one side and a dormant new development, Paynes & Borthwick Wharf, on the other. 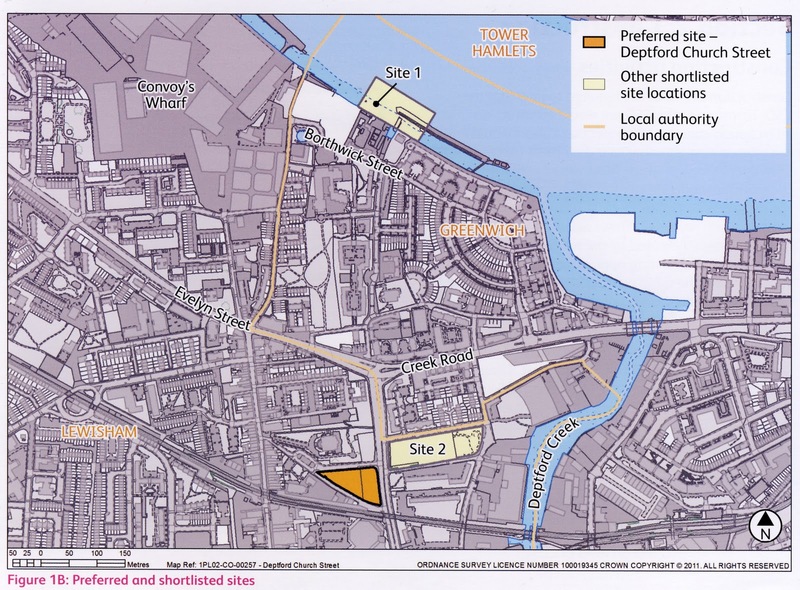 So Lewisham council have not had to shed too many tears in loyally mustering up support for the Don't Dump on Deptford's Heart campaign against the new preferred site in Deptford in opposition to the previously preferred site in Greenwich (what we call north Deptford). Overall Lewisham supports the plans for the Tunnel, since the Deptford Overflow Sewer is one of the top five offending overflows in London, but if they had had to choose between two 'Lewisham' sites, it might have been a different story. For Crossfielders and all those inhabiting Deptford Church Street this is a NIMBY NO BRAINER – there is no point in pondering which site is going to be least affected when you're faced with three years or more of major disruption. We do not have the option of the river, and don't forget that we will also soon be subjected to yet another building project when the council begin developing the old Tidemill School site. So stand up for yourself, your friends, family and neighbours and VOTE AGAINST this proposal. Unfortunately, it is a case of Us or Them. Go along to the exhibition at Creekside Centre and pick up a Comments Form. Fill it in there and then, or take it home to fill in and Freepost. By all means, stop and chat to the army of Thames Water representatives who will try to answer your questions. If it is a quiet period, you may find yourself surrounded by fifteen people who may all answer your question differently at the same time – rather intimidating. Stand your ground. One guy told us today that it wouldn't be lots of lorries, and that some of the vehicles used would be quite small. In that case, mate, go and build your stink pipe by the river! Deptford Miscellaneous has an interesting post that may appeal to your sense of injustice: "Here in Deptford the previously preferred bore site near Borthwick Wharf, where spoil could have left by river, has been replaced by a site in Deptford Church Street, where spoil will leave by road...it is hard not to suspect that...sites near middle class riverside developments have been replaced by sites in poorer areas." If you haven't got time to hang about at the exhibition, there is plenty of literature to take away, plus some free DVDs featuring different aspects of the project. Don't forget the Comments Form. Or comment online at www.thamestunnelconsultatioin.co.uk. Come and hear about Thames Water's 'Super Sewer' plans for the green area between Crossfield St and Coffey St on Deptford Church St.
Thames Water is also staging public exhibitions all over London as part of its Phase Two Consultation, but they have already declared the area next to St Paul's church as their preferred site (see the Deptford Dame's report) in this area. 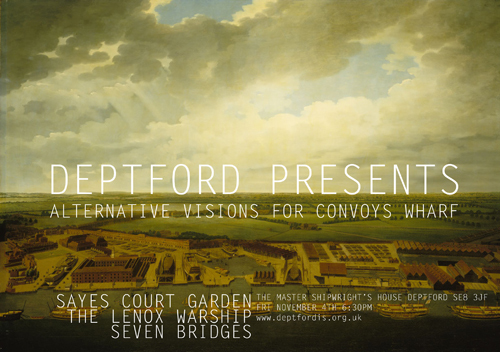 They will be in Deptford later this week (see below). Those concerned with the implications of Thames Water choosing the site in Deptford Church Street and how it will affect us should attend the first meeting tomorrow being held by the Don't Dump On Deptford's Heart campaign, so that you are better informed when you visit the Thames Tunnel exhibition at the end of the week. All comments and views must be submitted by 10 Feb 2012, after which Thames Water will formally submit their application for consent to construct the Thames Tunnel. Ken wants you to elect him Mayor of London in 2012 and needs to know what you want him to do to improve London. Billed as a Tell Ken event (in which Livingstone spends a day in a London borough listening to local residents), we're invited to tell him "our priorities for the area" and voice "our concerns about transport, policing, student fees and the economy". Ken has lost much of the popularity he enjoyed in the days of the GLC, and to some his glory days are over, but this blogger is old enough to remember those days, and witnessed significant change and improvements in the lives of Londoners (notably enlightened policies on transport and housing, and a celebration of cultural differences that kicked out racism) – only to later see a Blairite government (of which our present borough council administration was and still is a flagship) embrace an agenda that worked against those the Labour Party purported to represent. We know Ken has already made it a priority to deal with the betting shops, but now so has Boris. But will Ken, for instance, reverse the plans for Crossrail that involve taxing those boroughs who do not benefit from it? Will he take up the cause of local people in their objections to the plans for Convoy's Wharf, even though he is a self-confessed lover of skyscrapers? Ken's ticket has always been transport (pun unintended), but for Deptford the issue is likely to be housing – that's the issue that regularly fills Joan Ruddock's surgeries to bursting point. Note, it was Ken who introduced the requirement for new developments to be 50% social/affordable housing, a policy that was soon watered down (even in his time), but which has now reached dire levels with Lewisham's leadership willing to go with 15% "affordable housing" (which none can afford) at Convoy's Wharf (let alone the other developments Lewisham has rubber-stamped this year). Still with housing, maybe you're a council tenant threatened by Cameron's proposed policy on downsizing and would like to see a stronger opposition? If you're worried about unemployment or youth unemployment in particular, please pose your questions now. Perhaps you'd like to see a JOB CENTRE back in Deptford, and a new London Mayor put pressure on the appropriate authorities to provide one, by hook or by crook and no excuses. Maybe you'd like some support if you're worried about the Thames Tunnel decision to plonk their work station on your doorstep for the next 10 years (see www.dontdumpondeptfordsheart.co.uk/). Or maybe you eschew local difficulties for wider concerns and you'd like to see Britain pull away from the EU (though you may have very relevant local experience) and want to know where Ken stands? (Expect to see him toe the party-line there). Perhaps you'd like to see better representation of ordinary working people in London in the face of an overwhelmingly banker-friendly government and totally useless local councillors, but are not sure if Ken is up to the job? Get your questions ready. If you can't make it on Monday, please leave them here in the comments section. There is surely something we've forgotten. More info and a chance to comment directly to Ken at www.kenlivingstone.com/tell. Meanwhile, here's the list of candidates for the 2012 Mayoral elections, to be held on 3 May, if you didn't know already. A family-friendly day of performance and storytelling, activities and workshops, film and music, to mark the Hindu festival of Lights and British maritime connections with India. 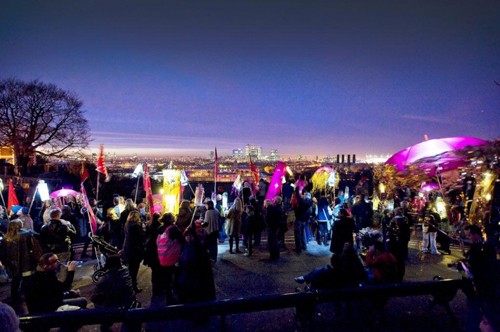 The day culminates in a lantern-lit outdoor procession in Greenwich Park led by local outdoor arts company Emergency Exit Arts at 4.30-5.15pm. To take part in the procession, join the lantern-making workshops at 11am-1pm and 1.30-3.30pm at the museum (all ages welcome). Since Diwali was actually 26th October (!) the day's events are really about flagging up the new gallery at the museum, Traders: the East India Company and Asia, which opened in September. If you haven't been to the museum for a while (or ever), the new wing and exhibition are well worth a look. Whilst 500 years of Deptford history is under threat from a multi-national company operating out of Hong Kong (we refer, of course, to Convoys Wharf) and by mostly all accounts supported by a weak and vain council leadership ready to trade heritage and local people's needs for some quick and easy Section 106 money that may never be spent in Deptford, more recent signs of the area's industrial heritage are now under threat. The lifting bridge at Ha'Penny Hatch lies under the jurisdiction of Network Rail. Rumour has it (yellow jackets and suits were spotted with technical equipment and were cross-examined by a local) they are considering its removal, due the potential costs of maintaining the structure, which obviously, should it become unsafe, may cause quite a hazard to train travel. Network Rail reckon they don't have enough cash to maintain the old iron structure. Many people refer to the lift bridge as the Ha'Penny Hatch, but the name actually refers to the lower crossing on the Creek. The bridge was built in 1963 to replace the original bridge dating from 1838. The Greenwich Phantom has a marvellous story on the history. Crossfields resident, artist and art lecturer, Tidemill parent and anti-Academies campaigner (among other things), Leila Galloway, along with fellow parent Esther, were caught on the hop on Wednesday when BBC Radio London picked up on an Evening Standard story that Crosswhatfields (among others) had covered. They contacted us to speak to them. Not always fast to react, we fielded the message to Leila, and the mothers were later that afternoon recorded live talking to reporter Jonathan Savage, who had picked up on the story that Tidemill Academy will be charging parents £20 a day for a play scheme when the school shuts early before Christmas so that it can make the move into the new Deptford Lounge accommodation. Ever since Workspace announced plans to redevelop Faircharm Trading Estate, most of its tenants have been facing an uncertain future. Cor Blimey Arts & Core Gallery – who have been developing their practice, activities and events for the past seven years into a blossoming international programme – are the latest to come up against the inflexibility of the landlords. Like all the other shyster developers, Workspace will no doubt be marketing their new development on the basis that it is situated in the heart of Deptford's vibrant and thriving artist quarter, as they contribute to a gradual squeezing out of grassroots artistic and educational activity. If anyone thinks community isn’t important, the recent ‘sign or get out’ debacle between Cor Blimey Arts/Core Gallery and our landlords Workspace at Faircharm Trading Estate will prove otherwise. On Friday, October 28th 2011 we were given the ultimatum to sign a financially constricting and binding contract to remain in our studios – or get out by Monday October 31st. We gave notice on our existing lease three months previously with the understanding that we were still negotiating terms on a new lease. It was insinuated that although our current lease would expire on October 31st, negotiations would continue after this date until an agreement was reached – a flexible agreement suitable for artist led spaces such as ourselves. However, it was with great surprise and dismay that, at the eleventh hour, we were presented with a ‘sign or get out’ ultimatum from Workspace. This demand came late on Friday evening, before the weekend when there would be no management personnel on their premises to answer our questions. To put their email into context, Workspace had kept us waiting for a reply to our previous correspondence for three weeks – this despite previously pleading with us to stay until 2013 at which time the whole complex will be redeveloped. Our position became untenable. Faced with possible eviction and damage or loss to our materials, equipment and artwork, we moved off site. Over the seven years Cor Blimey studios has been based at Workspace, we have supported artistic achievment and excellence, enhancing Deptford’s artistic community in the process. Unfortunately this has clearly not been recognised by Workspace. Workspace finally responded on Monday morning saying they wanted to keep us on the site, even suggesting we move all our work back in once negotiations have finished. Do they have any perception of how artists work and the financial constraints we are all under ? Simply hiring vans to move our materials is the equivalent to some artists’ entire studio rent for a month. At times like these, community is where strength comes from. Our studio community has shown tremendous steadfastness, courage and sheer hard work in the face of these dreadful circumstances. Deptford’s larger arts community have mobilised, with artists including Margaret Higginson, Graham Crowley, Michaela Nettell and Rich White helping us move into a temporary location nearby. Furthermore, the many messages of support we have received from across the world has been phenomenal. For this, we are deeply grateful. The Core Gallery ethos is generosity, integrity and nurturing artists. We have had outstanding exhibitions and fantastic events, and are proud to have strong principals and a great many supporters who admire them too. Cor Blimey Arts and Core Gallery are not just physical spaces – they will continue long into the future. In the new year we will be re-opening at a new site, continuing our internationally renowned programme of exhibitions, talks, events and support for artists. With our deep felt thanks and appreciation to our community. We shall keep you posted! In the meantime, there are some DIY Educate events left this year which we would love to see you at. "(Deptford High Street) is quite simply a very poor high street in an impoverished part of London with a market that sells a great deal of sub-standard merchandise. It has been like that for the last couple of decades. I guess there a plenty of people who would like it to be better and talk up every new development. Maybe they have invested in the area and are patiently waiting for it to take off so they can cash in. The station is being renovated and there half way down an odd looking building seems to have taken root. But it is always one step forward, one step back. 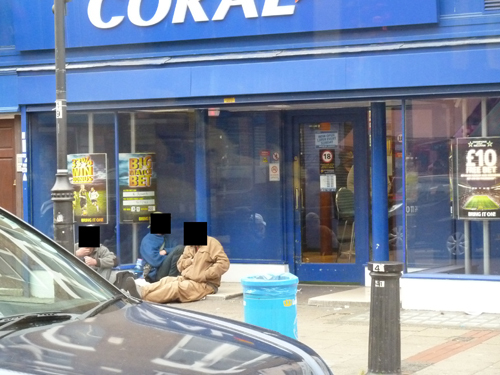 The High St is colonised by bookies, street drinkers very much in evidence and the area is beset by social problems. Creek Road has been developed and turned into a canyon lined by yuppie flats. 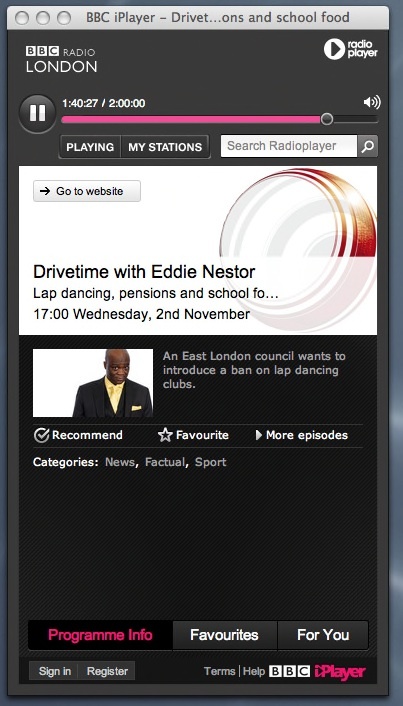 The marketing makes much of its proximity to Laban Dance School, while at the same time boxing it in. At the other end we have a Travel Lodge tacked onto another gated community of yuppie flats used as a dormitory by workaholics who spend most of their waking hours at Canary Wharf. The smattering of artists holed up in plywood cubicles fashioned out of redundant warehousing has yet to engender a chain of vibrant bars and nightlife along Deptford High St. It is no Brick Lane. Deptford is grim and I remain unconvinced that these developments will improve the area any more than previous efforts to tart the place up." For those unable to attend on Friday evening, the Deptford Is... exhibition Deptford Presents will also be open on Saturday 5th November, 9.30am – midday. At the AGM of the Crossfields Tenants and Residents Association, held on Thursday October 27th at the Pink Palace there was an interesting turnout. Among the twenty or so in attendance, there were only two Council tenants; I was one of them. The remainder were three officials and more than a dozen leaseholders or 'residents', i.e. people who lived in flats that had been bought from the council at some stage. This turnout in no way parallels the composition of who occupies the flats. I do not have access to the figures but I think at least 50% and maybe 70% still house council tenants. The questions I want to pose are, 1) Does it matter? 2) Why does this imbalance exist? and 3) Is there a way of increasing tenant participation? 1) I feel it matters a lot. All the 'Elected Posts' except Gardening Rep are now held by leaseholders, i.e. Chair, Treasurer, Secretary and their deputies as well as our voice on 'Lewisham Homes Committees'. Although our interests coincide on many fronts, surely property owners have different principle interests (some might even say different principles) than tenants. Think about it. I fear to go further and don't want to antagonize people some of whom are my friends but will offer just two examples. Why should leaseholders be interested in Cameron's mooted scheme on under-occupation? Why should tenants care about rising maintenance charges? 3) Please try to spread the message to tenants that they do have a role to play and they should have an interest in their immediate environment and by participation that they can help to improve it. Individually, we must encourage people to attend and if they do come, make them feel welcome and comfortable and part of something worthwhile. Ask yourself, what can I do?